Jane Austen Today: What did you think of Kate Middleton's (Duchess of Cambridge's) wedding gown? 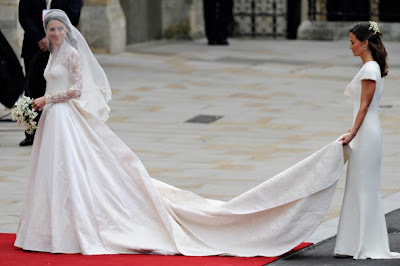 What did you think of Kate Middleton's (Duchess of Cambridge's) wedding gown? it was gorgeous so simple and i loved the veil. and not wrinkly like diana's at all. I liked it and thought it suited her well. Diana's gown, on the other hand, was altogether too frou-frou for my taste and could only have worked for a 19-year-old bride. I adored it. Strangely enough, it was just as I imagined it before the wedding. I was telling my husband that she would be wearing a tight lace bodice and a very classic, timeless dress otherwise. A great choice, and she looked fabulous in it! The dress was gorgeous. She is so slender that the padded hips were ok. The only thing I did not like too well was the foundation garment. She looked a little pointy up front. I would have preferred a small bustle to the padded hips...... it would be cute to see the bustle come back in on fancy dress! I thought she was simply beautiful and regal and her gown was modest with the long sleeves and high collar. A refreshing change from all the skin some brides show on their wedding days !!! I absolutely LOVED the dress, it was so elegant and simple and seemed to "fit" Kate's personality really well. I adored it! My only complaint was that all the beautiful handiwork on the skirt was only noticeable in close up photos but it was classic and timeless! I love Kate's wedding dress and it fit her perfectly. I love Will & Kate too.